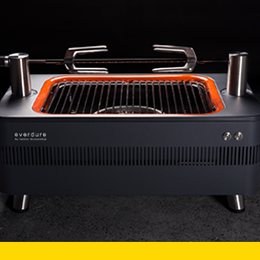 The Everdure by Heston Blumenthal charcoal range features three charcoal barbecue grills designed to suit any occasion. The CUBE is a compact portable barbecue with an integrated storage tray and bamboo prep board constructed from a double-lined steel body with a high-temperature powder coat finish and cool-to-the-touch handles. The HUB and FUSION, Everdure by Heston Blumenthal’s larger charcoal units, feature patented Rotiscope Technology, allowing quick setup of a commercial-quality rotisserie at three different heights, all while powered by a discrete motor. Enjoy easy charcoal lighting with the touch of a button through the Fast Flame Ignition System™. The Everdure by Heston Blumenthal gas barbeque range includes powerful 2 and 3-burner BBQs in an integrated, flowing design finished in a range of contemporary colors. Made from die-cast aluminum that won’t rust, the designs feature interchangeable cast iron flat and grill plates with cool-to-touch handles so you can change plates easily. Integrated flame-tamers eliminate flare ups during cooking. The easy-to-clean, enamel-coated high hood creates a 360° circulation around the food. Fast ignition with instant searing means you're ready to cook in 5 minutes, while slender taps put variable flame control at your fingertips.